Chicago is a naturally beautiful city, however its charms are often degraded by the sight of the discolored and tattered plastic bags that line some of its streets and thoroughfares.Â Whether one is a tourist from London or simply someone from Mt. Greenwood or Lincoln Square on their way to work, having to pass or drive by such loose refuse can take away from what is otherwise a striking and majestic skyline.Â Such debris, simply put, is a type of ugliness that is unfit for a major metropolis, especially one that is graced by the worldâ€™s most impressive skyscrapers, homes, and parks.Â The shopkeeper, as well, is always disgusted when, on their own way home from work, they come across a bag bearing their storeâ€™s logo on the street.Â Itâ€™s embarrassing and does their business no good in the eye of the public. Itâ€™s also precisely why we only care high quality, durable plastic bags. Retailers have bagging needs that are as wide ranging as the products they sell.Â Some specialize in small, boutique goods while others tend toward wholesale merchandising.Â For this reason we offer a variety of bags, including T-shirt, Die Cut Handle, Dry Cleaner Poly, Garment, Poly and Reclosable Poly bags, as well as trash liners.Â Though they come in various sizes, colors, and cuts, one of the things they have in common is their ability to resist even Chicagoâ€™s weather. As we also offer customized printing for many of our bags, we know that retailers do not want to see the brands and logos they have worked hard to promote turned into the face of street litter.Â For the retailer a bag is more than just something for carrying a product.Â In the case of printed bags itâ€™s also a form of advertisement.Â When a customer walks down the street carrying fine goods that have been purchased in their store, that shopper is also telling others about the store.Â People do, and will, ask that shopper about whatever sales they may have just experienced.Â When it comes to plastic bags Chicago businesses can count on to inspire such inquiries, weâ€™re your supplier. Business is made easier, and more profitable, when things like supply chains can be simplified.Â Though itâ€™s often not possible to reduce the number of products being used, the life of a retailer or manufacturer can be simplified by limiting the number of suppliers they have to rely on.Â This is true for things as basic as labels, packages, and even plastic bags. Our mission is to make running your business easier so that you can focus on working with customers and developing your product line.Â We understand, whether your operation is large or small, that youâ€™ll probably need to use a variety of bags during any given business day.Â This can range from ones used to package the goods a customer has just purchased, such as T-shirt and Die Cut Handle bags, to anything you might need to store or discard items from your showroom, shop, or warehouse, such as re-closeable poly bags and trash liners.Â Itâ€™s easier for you, the business owner or manager, if you can order all of your bagging and packaging supplies from one source. We also realize that something as simple as a plastic bag is more than a container for purchases.Â It can also be a form of advertisement.Â Whether a shopper takes the train, a bus, or just walks home, dozens of other potential customers will spot the bags they are carrying their new purchases in.Â A bag, then, can become a walking billboard.Â Other than introducing possible patrons to your store, bags that bear your logo can generate buzz if they are seen frequently enough.Â Youâ€™ve worked hard to start your business, select quality products for it to carry, and develop positive relationships with your clientele, so donâ€™t you want everyone on the train or at the restaurant across the street to notice how many customers you have? If youâ€™ve been looking among plastic bag suppliers for a partner that can provide your business with any type of bag it might need, including bags that can be printed with its logo, then you have found the right place.Â Weâ€™ve been helping Chicago area businesses with their packaging needs for nearly twenty years.Â Weâ€™d love to start helping your business with its packaging needs today. One of our most unique shopping bags is our exclusive Hair Art shopping bag (Item T-HB 30) . Created by our own staff to cater to our beauty supply retailers, the Hair Art bag is efficient and functional. Beauty supply retailers across the country love this elongated shopping bag for long hair pieces and braids. No more folding and bending hair pieces! No more stuffing into smaller shopping bags! The Hair Art shopping bag offers a great solution to retailers and their customers. 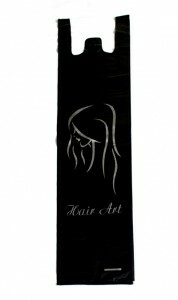 The Hair Art shopping bag is 8+5×30 and there are 500pcs per case and it is available in Black and Midnight Blue. Click on the image to be directed to this item on our site!